Kyle Grillot - kgrillot@shawmedia.com The Harvard team watches as the Richmond-Burton team warms up beforethe start of the regional quarterfinal match between Richmond-Burton and Harvard. Richmond-Burton won the match. 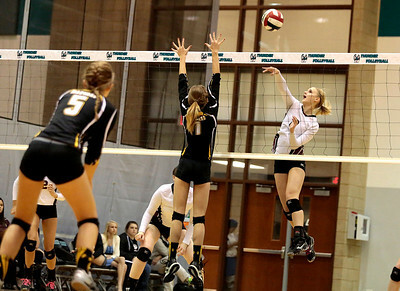 Kyle Grillot - kgrillot@shawmedia.com Richmond-Burton sophomore Jessica Duncan and senior Alexandra Frantti jump to block Harvard junior Kaylee Bischke's spike during the first game of the regional quarterfinal match between Richmond-Burton and Harvard. Richmond-Burton won the match. Kyle Grillot - kgrillot@shawmedia.com Richmond-Burton senior Alexandra Franti spikes the ball during the first game of the regional quarterfinal match between Richmond-Burton and Harvard. Richmond-Burton won the match. 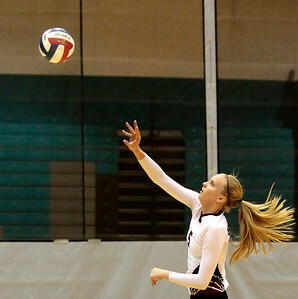 Kyle Grillot - kgrillot@shawmedia.com Richmond-Burton sophomore Jessica Duncan spikes the ball during the second game of the regional quarterfinal match between Richmond-Burton and Harvard. 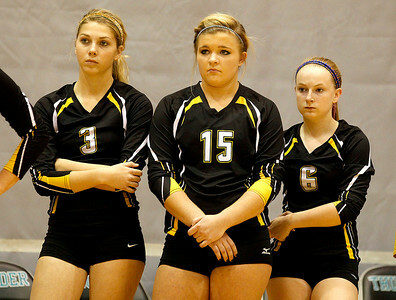 Richmond-Burton won the match in two games. Kyle Grillot - kgrillot@shawmedia.com The Richmond-Burton team celebrates a scored point during the first game of the regional quarterfinal match between Richmond-Burton and Harvard. Richmond-Burton won the match. Kyle Grillot - kgrillot@shawmedia.com The Richmond-Burton team celebrates the final point of the second game of the regional quarterfinal match between Richmond-Burton and Harvard. 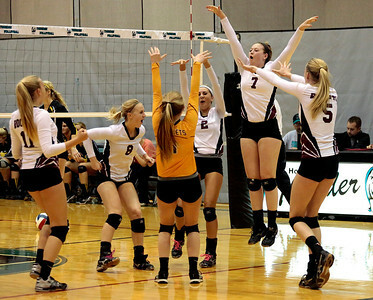 Richmond-Burton won the match in two games. Kyle Grillot - kgrillot@shawmedia.com Richmond-Burton senior Alexandra Frantti hits the ball over the net during the second game of the regional quarterfinal match between Richmond-Burton and Harvard. Richmond-Burton won the match. 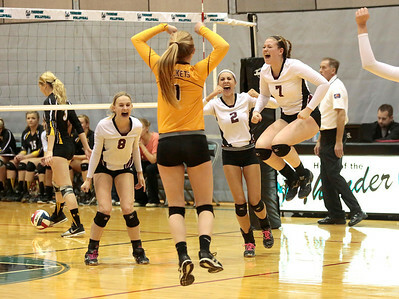 The Richmond-Burton team celebrates a scored point during the first game of the regional quarterfinal match between Richmond-Burton and Harvard. 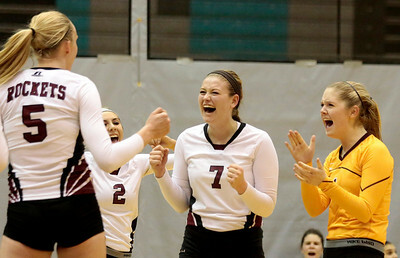 Richmond-Burton won the match.